Workington general manager Alec Graham says a factor in the club being put up for sale is increased travel costs. Despite playing in Conference North, the Cumbrian club must travel to Histon in Cambridgeshire, Bishop's Stortford in Hertfordshire, and Oxford City. "It's tough financially with Conference North having so many southern clubs," Graham told BBC Radio Cumbria. "Premiership teams, Swansea aside, must travel less than we do - it's cost us around £100,000 these past four years." The Reds board are currently looking for new investors and speculation has arisen that the club could go out of business. They finished 14th in Conference North this season, eight points clear of the relegation zone. 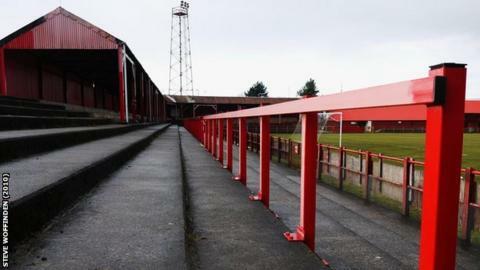 Workington were promoted from the Northern Premier League in 2006 and have twice been defeated in Conference North's end of season play-offs, most recently losing to eventual winners Alfreton in 2010. "There's no debt so it's a brilliant situation to put in a little investment and have a good, steady Conference North club," Graham added. "Basically the board have decided the time is right to go. "They took over in 1999 when the club was two days from going out of business, cleared £120,000 of debt and have achieved four promotions. "Now with the board all in their 70s or older, it makes sense to leave with a clean slate. "It isn't quite this 'Reds in crisis, two weeks from going out of existence' situation as some local papers would have you believe."